DAVID KIM is a well known singer-actor in Korea whose Korean name is Kim Jung Wook. 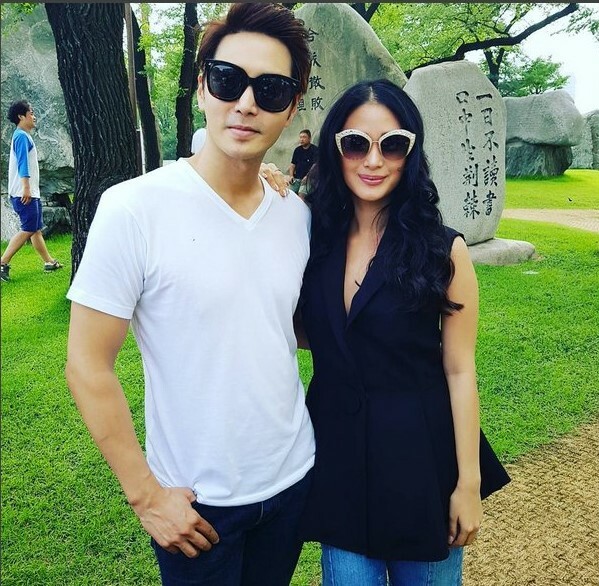 He’s now one of the Korean actors who get to work with Heart Evangelista in GMA-7’s new primetime show, “My Korean Jagiya”, that starts airing on Monday to replace “I Heart Davao” that will end this week. He has gained acclaim for his acting in two Korean shows, “Iris” and “The King is in Love”. And he looks better in person than on screen. As a singer, he is famous for the hit song “Only You”, which is the theme song in the popular Korean reality show “We Got Married”. He has a college degree in industrial engineering from Konkuk University and took post graduate courses at the Kyung Hee University Graduate School of Communication, both in Seoul. In “My Korean Jagiya”, David plays Kim Ji Hu, the older brother of lead actor Alexander Lee as Kim Jun Ho. Their relationship as brothers is torn apart when David snatches from Alexander his Filipina girlfriend, played by Valeen Montenegro.